Detailed but fast is how I like to do my 28mm Historicals, how do you combine the two though? 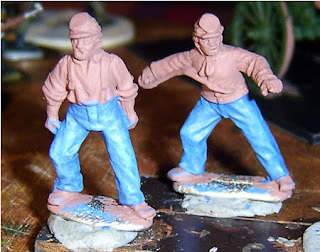 Well everyone has there own style, and in Wargaming circles layering and black lining styles are popular; but I use those selectively and prefer an old method I think I picked up from the White Dwarf ‘Eavy Metal pages many, many years ago. 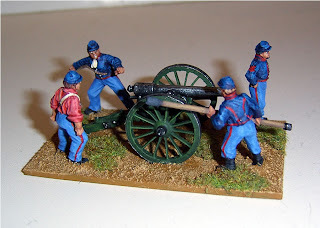 Todays subject is the Massachusetts Light Artillery for my ACW force. Start by undercoating the models; in this case I used a tan colour, not black or white I hear you say; well, as I’m not doing a black lining technique a shade that allows the colours on top to glow is fine. To be honest, I use an undercoat just to make paint adhere properly, Black is favoured only if troops wear a lot of it anyway, a white undercoat is essential only if troops wear a lot of white, other wise any colour will work! Anyway, this technique relies on planning, usually I’ll start by getting the pants and jacket done, or tunic, or whatever. Here it’s the pants. 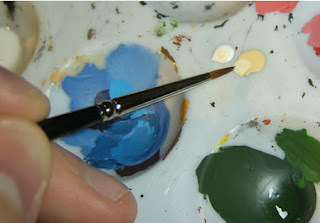 Start with a shade slightly darker than the main tone you want and paint cleanly. Now get a suitable brush, here in the photo you’ll see it is stubby and looks ragged, the ideal sort is not to flexible, dense and not splayed out, it won’t have a point. Now take a lightened tone of your base coat, and get some on the brush, clean it off so it doesn’t flow off the brush but the brush is not dry. Stroke vigorously over the areas required. Next lighten the paint more and repeat, avoiding some of the previous coverage. For the sample model the second highlight would gravitate to the knees, backs of calves and buttocks. Next for this figure is the jacket and kepi. And it’s the same process, though here with a finer brush. A word on colour work. Many people will simply say darken with black and lighten with white. This will produce very poor results. Black makes colours too dark, or dirty. White, too flat. Here the deep blue was mixed on a live pallet with a very bright blue. The red shirt was highlighted here with a light flesh tone. In relation to this I would add that I custom mix most non-standard colours. In fact my collection of paints runs to less than forty colours, including five metallics and a handfull of specific modern camouflage shades. I am not a baliever that you need premixed pots for every shade under the sun, with a little practice it can be done by eye for a lot less cost. For the details I rely on layering, which is Ideal for straps, belts, pouches, boots and of course flesh. If possible work from a live pallet, i.e. with wet paint to mix, as an artist would. For this a good quality sable brush is essential. Here the braces have been worked up from a linen base to white in four layers. The flesh will be done with three layers in the same way. 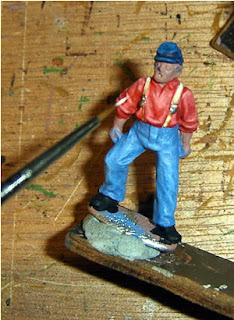 Once finished the models are attached to their base, here with the field piece a 3” Parrot rifle. 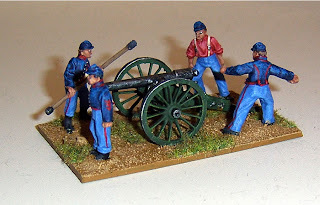 The cannon was highlighted with the same overbrushing techniques. Finally the base is finished. 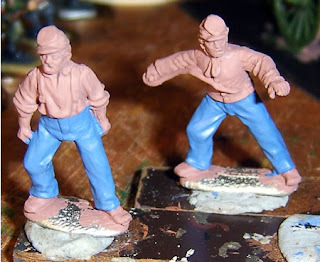 Never, never ignore basing; it is what unites the models and good basing will raise the look of even poor figures. Here it is a layer of sand, painted brown, drybrushed with desert sand and then given a liberal layer of static grass. And that’s it done. 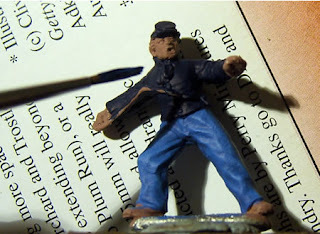 This was a one-off model and as a rule efficiencies of scale speed up painting. This model, including the cannon and basing took about 3hrs to do. Once practiced the entire process comes to around 15minutes per figure for simple models like these or ancients. 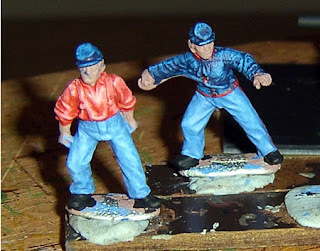 Napoleonics are at least double that because of all the extra detail. 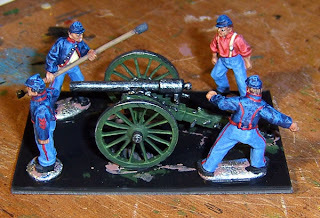 Almost as an aside, It adds the artillery element to my Union Brigade as well. Only the general to go now. Personally I never paint eyes as they rarely work well. I prefer to shade the face and have dark recesses for the eyes. Colour works well though. 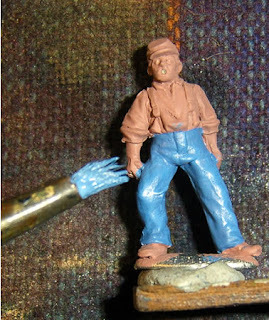 I aim for a three coat process aka Foundry but using GW paints. Le Harve - the game!? !